Most Black Powder Cartridge Rifle shooters feel that a Drop Tube is a must for accurate Black Powder Cartridge Rifle Shooting. This technique allows the black powder to be trickled into the case through the Drop Tube . One of the benefits of using the Drop Tube is more powder can be used, but the primary reason for the Drop Tube is that pouring the powder through the Drop Tube settles the powder and this helps the powder to burn cleaner and more consistently. The fouling is also reduced, while accuracy is improved. Our 24″ Drop Tube is constructed of solid oak and is adjustable for various length cartridges by utilizing the unique locking knob. The 23″ copper tube has a 3/8″ outside diameter. 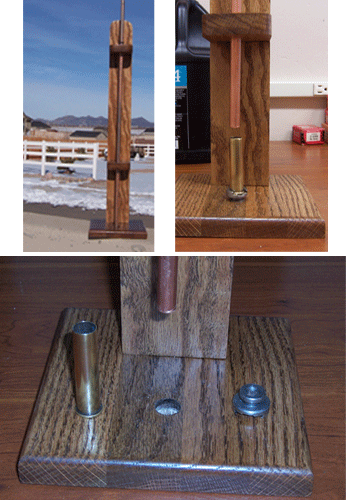 The solid oak base, which measures 5 1/2″ x 5 1/2″, allows for a sturdy, easy mounting to a loading bench. I just recently purchased a drop tube and found the quality of the item to be of very good quality both in craftmanship and material.